"We are not done demanding justice for Trayvon Martin," says Ben Jealous. So far, more than 350,000 people have signed petitions demanding federal action. The formal language describes a first step that, while it is encouraging for civil rights organizations, does not assure that a federal case will be initiated. But the NAACP and other groups are arguing that there are clear grounds for an intervention by the department. Within three hours of the online posting of the petition late Saturday evening, more than 350,000 Americans had signed it. The response was so intense that the group’s website crashed Sunday morning. But the #JusticeForTrayvon petition drive continued at the MoveOn.org petition site and a refreshed NAACP site. In addition to pressing for action at the federal level, the NAACP and other groups were turning attention to state capitols in the aftermath of the Zimmerman acquittal. 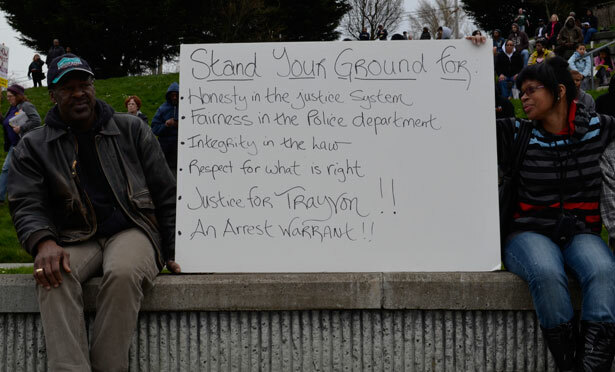 Zimmerman, who faced charges only after a national outcry forced a review of the case, did not mount a specific “stand your ground” defense. But the issue remained a bone of contention before and during his trial; notably, the jury heard from a witness who recalled teaching about Florida’s law in a college course that the defendant completed in 2010. And when jury instructions were made in the case, the judge said: "If George Zimmerman was not engaged in an unlawful activity and was attacked in any place where he had a right to be, he had no duty to retreat and had the right to stand his ground and meet force with force, including deadly force if he reasonably believed that it was necessary to do so to prevent death or great bodily harm to himself or another or to prevent the commission of a forcible felony." Brendan Fischer, a lawyer with the Center for Media and Democracy, notes that: "This language is nearly identical to that in the Florida Stand Your Ground law and the ALEC "model" legislation. We cannot know if the outcome would have been different had the six jurors been instructed differently — but we do know that Stand Your Ground played a role in the case, even after Zimmerman's arrest." The sustained outcry over the February 26, 2012, shooting of Martin appears to have led the NRA and ALEC to halt advocacy on behalf of “stand your ground” laws. But the laws continue to influence criminal justice nationwide, as the Center for Media and Democracy has documented. The NAACP, the Urban League, Color of Change, Common Cause, People for the American Way and MoveOn.org were among many groups that pressed ALEC on the “stand your ground” issue in 2012. Several of these same groups have taken the next step and are urging legislators to strike the laws from state statute books. Why did George Zimmerman get acquitted? Because white supremacy enables the lingering belief that some black men must be killed with impunity for society at large to be safe, says Aura Bogado.